We've been fantasizing about it for months, and finally warmer weather has arrived. We know: You just want to fire up the grill and start working on your tan—we do, too! But before you can kick back in your hammock (or in your pool on your giant patriotic bald eagle float, if that's your thing), there are a few tasks you’ll need to tackle. And you can bet they're all outside. 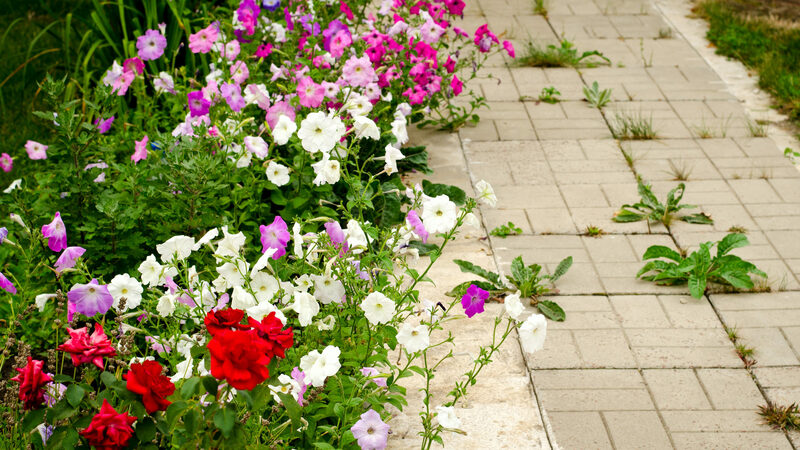 “The old adage ‘April showers bring May flowers’ rings true and makes May prime time for landscaping and lawn care in most of the country," says Missy Henriksen, vice president of public affairs for the National Association of Landscape Professionals. But it goes beyond gardening and yard work. Now's the last chance to take care of all that winter wear and tear and transform your home's outdoor space into something worthy of the host with the most. The good news? We're here to make it as quick and easy on you as possible—with our handy checklist of home maintenance chores, you can knock them out and get back to that pool float ASAP. We’ve provided tips for doing each task faster and easier—or with the help of a pro. Don't let your brick and stone walkways fall through the cracks. Task: Freezing temperatures can wreak havoc on hardscape surfaces made of loose (unmortared) brick, stone, and concrete paving materials. Check to see if frost heave and erosion have caused pavers to shift, rise, or sink. You’ll want to fix any unevenness for safety as well as aesthetic reasons. Shortcuts: Repair hardscape surfaces using a wheelbarrow filled with playground sand and a sturdy trowel. Pry up displaced pavers, smooth and even out the bed with fresh sand, and replace the paver. Call in the pros: This is a good job for a handyman. Expect to pay $30 to $60 an hour, depending on your location. Task: After a wet spring, your lawn might be looking quite rich and lush. Since Mother Nature did the hard work, you can sit back and relax, right? Not so fast. Grass loves nutrients, so now's the time to add high-nitrogen fertilizer to help suppress weeds and keep your lawn looking great all summer. Shortcuts: A push-powered broadcast spreader makes quick work of fertilizing your lawn. You’ll find spreaders suitable for an average suburban lawn for $35 to $100. If you have a cooking compost pile, you can substitute home-grown compost for commercial fertilizers. Call in the pros: A lawn care company will spray on a chemical fertilizer for about $40 an application. Task: Cycles of cold and wet weather cause wood to move, twist, and warp. That can make garden gates fall out of alignment, and can cause fence pickets to loosen or fall off. Check for signs of loose fencing, and fix sagging gates. Shortcuts: A cordless battery-powered nail gun ($250) makes quick work of refastening pickets and fence supports. Use only galvanized nails for outdoor work. Use a power drill fitted with a screw tip or a hex driver to remove or tighten loose screws and bolts in gates. Call in the pros: This is a good job for a handyman. You’ll pay $30 to $60 an hour, depending on your location. You'll be mulch happier in the long run if you care for your gardens now. Task: Prevent evaporation and help keep weeds in check by insulating planting beds with 2 to 4 inches of mulch. Shortcuts: Set aside a mulching day, and have a landscaping service deliver bulk mulch and dump it where you can get to it easily (like your driveway). Plan on 1 cubic yard of mulch to cover 100 square feet, with mulch 3 inches deep. Call in the pros: A landscaping service will put in the mulch, but it'll cost you—to the tune of $250 to $560 for 500 square feet, depending on your location. Task: As your yard takes shape and your gardens come into full bloom, you’ll want to see everything clearly. It's time to wash away winter’s dirt and grime from your windows. Shortcuts: Have a partner clean the outside while you do the inside of the same window. That way, you can identify which side of the glass contains lingering streaks and smudges, and get rid of them on the spot. Plus, who wants to clean alone? Call in the pros: In addition to cleaning the glass, a professional window washer will remove and clean screens and remove accumulated dirt from sliding tracks for $2 to $7 per window. It's time to get all up in your grill's grill. Task: Nobody wants a rack of ribs with last year's grill gunk on them. Before you fire up the ol' barbecue, make sure your grill is clean and that any gas hoses and connections are secure. Shortcuts: No matter what kind of grill you have, invest in a grill brush or other coarse cleaning brush, remove the grates and metal plates beneath them, and soak them in hot soapy water for five to 10 minutes. Then scrub hard. To rinse, spray them with the hose. Cover the area where the grates usually go with foil, and use a stiff grill brush to clean grime from the hood and inside walls. Use a cleaner specifically designed for your grill's surface (e.g., stainless steel, porcelain, or cast iron), and reassemble all parts. Call in the pros: There are professional grill cleaners who will take your barbecue from slimy to spotless, but it will cost you the equivalent of a few porterhouse steaks. This Denver cleaning service offers quotes from $185 to $279. Task: Now's your last chance to double-check your air-conditioning unit and make sure it's in good working order before the mercury starts to rise. Shortcuts: Hook up a garden hose and spray the outside of the condenser to remove any dust that's settled on the unit and connections. (Yes, dust can affect your AC's effectiveness.) Don’t use a brush, and be careful if pressure washing—you could damage or bend the fins. Make sure to change the filter, too. Call in the pros: Having a pro service your AC system costs $100 to $250 and includes cleaning the condenser and lubricating the fan motor.